The BBC has disqualified the winners of University Challenge for breaking the rules by using a contestant who was no longer a student. The title has been transferred to the University of Manchester, who were beaten by Corpus Christi College, Oxford on the TV quiz last week. By the time the final was filmed Sam Kay, from Surrey, was working as an accountant at PricewaterhouseCoopers. Mr Kay has apologised and said "it was never my intention to mislead anyone." 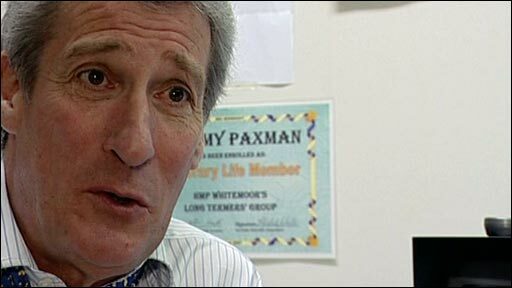 Jeremy Paxman: "It's very unfortunate - but rules are rules"
University Challenge quizmaster Jeremy Paxman said: "I suppose it is mildly embarrassing but I do feel sorry for the Corpus Christi team - I mean they were all legitimate students when it started. "But rules are rules, and they had to be stuck to." Manchester captain Matthew Yeo said he was "saddened" to win in this way. A joint statement from the BBC and Granada said: "The University Challenge rules on student eligibility are that students taking part must be registered at their university or college for the duration of the recording of the series. "Whilst obviously not intending to, Corpus Christi broke this important rule when other universities and colleges taking part adhered to it. "We therefore find ourselves in the regrettable position of having no choice but to disqualify Corpus Christi from the final. This means they forfeit their hard-fought title which now goes to the Manchester University team." In the introductory part of the show, Mr Kay told viewers he was studying chemistry. But PricewaterhouseCoopers told the BBC Mr Kay was employed as a graduate accountant last September and is training to be a chartered accountant. The final was filmed in November and Mr Kay was an important factor in the showdown, answering two "starters for 10" at a crucial point when his team was trailing. According to newspaper reports, Mr Kay failed to get funding for a PhD and left the Oxford college after graduating last year. Speaking after the decision he said: "I hugely regret not confirming my change of status to the University Challenge programme makers before the final rounds." "I had honestly believed I was eligible as I had indicated my course dates when I applied." The second placed Manchester team had said they had "no desire" for a rematch. Mr Yeo told the BBC: "I'd like to congratulate Corpus Christi once more for what was an excellent game and for giving the University of Manchester team a really good game in the final. "The question of eligibility of the players is the province of the BBC rather than for the University of Manchester or its students to comment on. As a team we knew we each had another year left on our courses before we would leave. "But we accept we were beaten by a fantastic Corpus Christi team. It's very unfair to detract from Corpus's stupendous victory and to detract from the achievement of Gail Trimble, their fantastically talented captain." 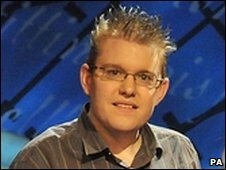 A spokesperson from Corpus Christi college said: "Our students entered University Challenge in good faith. The team had a wonderful run and we are, of course, disappointed to be losing the title." The final had already made headlines due to the performance of Corpus Christi's team captain Ms Trimble. The 26-year-old was nicknamed the "Human Google" after scoring two-thirds of her team's 1,200 points on the way to the final. Ms Trimble was unavailable for comment, referring all calls to the university. 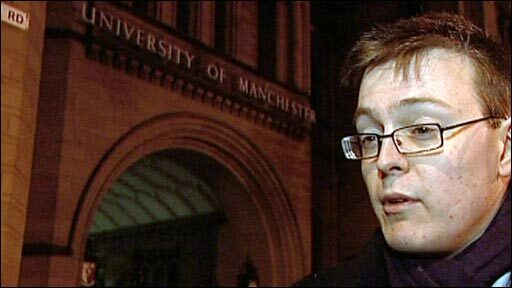 The captain of last year's winning University Challenge team said it was a "tragic" way for Manchester to win the contest. Christ Church Oxford team leader Max Kaufman told the BBC: "I don't think anybody would really want to win under these circumstances. "And I think given that there's no cash prize at stake and it is purely for the honour of the thing I feel it is rather a tragic way to win in the end." One Manchester University student said for her team to win under these circumstances "tarnished" the victory. Cori Bromfeld, 22, said: "I was talking to some of my friends and we think that Manchester did brilliantly to get to the final, and to win in this way does take away some of the achievement. "People in the future will say that we only won because the other team cheated." Does University Challenge really test intelligence?